As Ramadan, the annual Islamic fasting season, begins, prices of various food items have increased in Abuja and its environs. A recent News Agency of Nigeria (NAN) survey of markets in the Garki, Bwari, Wuse neighbourhoods of Abuja as well as in Mararaba, Nasarawa State, revealed between a five to 10 per cent rise in the prices of foodstuffs. For instance, in the markets of the four areas, the prices of different brands of a 20-litre gallon of vegetable oil have increased from N12,300, N10, 480, N9, 700 to N14, 200, N11, 100 and N9, 900 respectively. Similarly, a 25-litre can of palm oil, which formerly cost N9, 000, now sold for N10, 500. But traders attributed the increase in palm oil price to the onset of the rainy season. NAN observed that the price of tomato has spiralled, as a big basket of tomato now attracted prices ranging from N15,000, N22,000, N25,000 to N30,000; up from its old price of N15, 000 and N12, 000 and N9, 000, depending on factors such the freshness and the species of the tomato. The prices of a big basket of chilli pepper had fluctuated between N12, 000 and N15, 000, depending on bargaining power of the purchaser, while price of a big basket of the pepper variety known as tatashe had also increased from N13, 500 to N17, 000. NAN gathered that barely two months ago, a polythene bag of white garri sold for N10,000 but the price had now shot up to N14,000. The price of a mudu (measure) of garri had increased from N120 to N170, while that of a paint-rubber measure of the commodity had increased from N350 to N450. The price of a 100kg bag of white beans had risen from N30,500 to N38,000; the cost of a similar quantity of red beans had increased from N45,000 to N60,000, while a mudu of red beans now cost N470. In respect of rice, the price of a 50kg. bag of rice ranged between N13,000, N17,000 and N22,000 — depending on its brand — while the markets were fully stocked with the made-in-Nigeria varieties of rice. Similarly, the prices of iced fish in some cold rooms in the Mararaba neighbourhood of Nasarawa State had increased considerably. Before now, a carton of mackerel fish cost between N12,000 and N14,000; but the carton now costs N22,000, while the price of a carton of croaker fish nowadays was N35, 000. The market survey also indicated significant increases in the prices of other food items like water yam, yam, cocoa yam and potato but the price of sweet potato had somewhat remained stable. Going from the general to the specifics, price of a set of five big tubers of yam, which formerly cost N2, 800, now sold for between N3, 500 and N4, 500. The price of the water yam species had also changed, as a set of five tubers of water yam now sold for N2, 500, as against its former price of N2,000. A bag of Irish potato, which used to sell for N7, 000, now attracted prices ranging between N10, 000 and N10, 500. NAN also discovered that the prices of frozen food items and poultry products, including eggs, fish, turkey and lobster, were on the increase. Eggs were now sold in the markets at N1,000 or N1,100 per crate, compared to the previous price of N800 or N900 per crate. A jute bag of dried onions, which previously sold for prices between N9, 800 and N11, 000, now cost between N18, 000 and N22, 000; while a jute bag of fresh onions now fetched N15, 200, as against its former price of N9,000. NAN, however, noticed that the prices of other consumables like beverages, sugar, milk, bread and noodles have remained stable in the last two months. Imoyosola Ajao, a civil servant, nonetheless, told NAN that she had resorted to buying only essential commodities, instead of going for all the things she needed because of the high cost of most items. She said that a mudu of corn flour, which cost N245 a couple of weeks ago, now sold for N270, while a mudu of cassava flour now cost N175, up from its N140 price a couple of weeks ago. Mrs Ajao bemoaned the continuous increase in the prices of food items in the market, saying that government ought to initiate some price-control strategies to stem impulsive increases in food prices. Nevertheless, some traders in the markets have attributed the price increases to seasonal factors, forced migration of farmers due to the current security challenges facing certain parts of the country and increase in transportation costs. They also blamed the increase on factors such as flood, high cost of transportation, high interest rates of loans, ageing farmers and rainfall patterns, among others. The traders stressed that price increases had caused some setbacks for them, saying that there had been a remarkable fall in patronage. 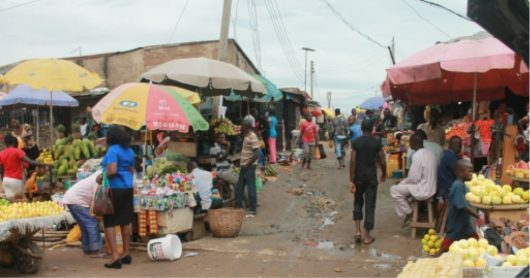 One of the traders, Eunice Nwachukwu, said that the fall in customers’ patronage had affected the economic wellbeing of the traders, adding that some of them who got bank loans for their businesses had not been able to pay back the loans. She said most of the shops in the markets were owned by government officials who rented them out to traders at high rates, thereby forcing the traders to jack up the prices of their wares. Another trader, Alima Agbaje, said that in recent times, most customers could not engage in bulk purchase of food items, adding that they instead make piecemeal purchases because of the prevalent cash squeeze. She said that the development had affected sales in most markets, while the drop in sales had forced several traders to abandon their shops, thereby creating chances for the remaining traders to increase the prices of their wares arbitrarily. However, Agnes Igiewe, a plantain seller, blamed the increase in the prices of food items on factors such as the unwholesome practices of middlemen, dealers and shop owners. She stressed that the problem was compounded by the harmful habits of middlemen who impulsively jacked up the prices of food items arbitrarily. Ralph Abakuku, a stock fish seller, also attributed the increase in the prices of food items to the prevalent cash flow problems in the country, which had forced many traders to obtain bank loans without consideration for the high interest rates of the loans. Another farmer, Abdullahi Danbaba, blamed the current increase in food prices on unstable rainfall patterns and erratic electricity supply. He said most of the food crops were cultivated via irrigation farming, adding the unstable electricity supply had forced most irrigation farmers to rely solely on the use of petrol to operate their equipment. He said that the farmers then had no other option than to increase the prices of their crops to enable them to break even. In the main market of Bwari, a satellite town in the FCT, most of the traders attributed the high prices of food items to Ramadan. They said that some traders often review food prices up in the lead-up to the fasting period. All the same, Silas Alejolowo, an agriculturist, told NAN that prices of food would continue to rise if the country’s farmers continued to face myriad challenges. He also noted that most youth in the country were not interested in taking up farming, while inadequate efforts were also being made to encourage the youth to embrace agriculture. He said that this was as a major challenge facing efforts to boost Nigeria’s food security, adding that the challenge was reinforced by the fact that agriculture in the country was labour-intensive and still relied on the use of crude tools.